If the Big One strikes tomorrow, how ready will we be? That fact that our coast is due for a particularly nasty earthquake is not breaking news. We’ve known this for a long time. But with the recent earthquake in late December (albeit of low magnitude) questions of preparedness and emergency planning are at the forefront of people’s minds. As a school with over 19,000 students, many of whom bustle to and from campus on a daily basis, the question of how prepared our university is for calamity has perhaps never been more relevant. If “the big one” was to hit the coast tomorrow, would we be ready? To answer that question, it’s important we know what we’re up against. Admittedly the quake that rattled the coast in late December was rather tame—many slept right through it. Those who were awake for the five to 10 seconds of mild tectonic excitement know that it did little more than drive people towards social media to ask, “Was that an earthquake?” But just because the earthquake was minor, doesn’t mean it should be ignored. Beneath our feet is a tectonic plate known as the North American plate, and about 200 kilometres off the coast of Vancouver Island is another plate called the Juan de Fuca plate. Both of these plates are moving slowly—about three to six centimetres towards each other every year, Juan de Fuca moving east and the North American plate moving west. This isn’t cause for concernnecessarily, as tectonic plates are moving all the time. The important thing is what’s happening between them. The fault line where these two plates meet is known as the Cascadia Subduction zone. 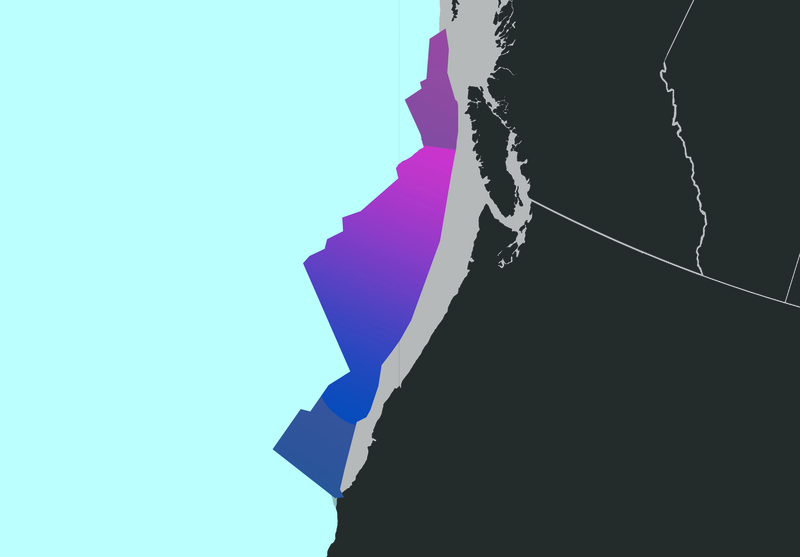 This subduction zone is about 1,000 kilometres long and stretches from the northern part of Vancouver Island down to the northern end of California. Of course, there’s much more to this than that, but if—or when—this megathrust happens, we’ll know for sure what kind of planning has gone into the safety of students because that planning will be put to the test. This emergency notification system he is referring to is the Alertus Mass Notification System. You may have seen it around campus—it’s those black and yellow boxes on the wall that look like really intense thermostats. Klein goes on to explain that accompanying the Alertus system are outdoor speakers and the ability to override computers to display an alert message. Essentially what this means is that if there is a natural disaster, you’ll know about it very quickly. You could argue that a simple notification system doesn’t seem like sufficient preparation for a potentially catastrophic earthquake, but having a heads up could be a lifesaving advantage. The reality of the situation is that a lot of the preparation responsibility lies with us, not just as students but as citizens. Do you know what you would do in the event of a natural disaster that could be potentially very lethal? Do you have a plan? It’s worth asking yourself. “I think with an earthquake your number one concern is always going to be your family,” says Jackie Kloosterboer, an Emergency Planner for the City of Vancouver and author of My Earthquake Preparedness Guide: Simple Steps to get You, Your Family and Pets Prepared. After the earthquake subsides, panic will set in. People will be scrambling to connect with their loved ones to make sure they are alright. However, it may not be possible to use your phone or even a landline if the damage is sufficient—in this case, it’s best to have a planned place to go. She suggests designating a place to go that your family will know about. Somewhere familiar like a friend’s place. That way, in the event of an emergency, people have an idea of where to look for you. And lastly, Jackie expresses the importance of an emergency kit. An emergency kit is an all-purpose survival tool that you can buy from a store or put together yourself. It could be as big as a suitcase you keep in your car, or something more compact that you could fit in your backpack. There are many websites that have lists of things that belong in any emergency kit—the Red Cross’s website has a great checklist. Kloosterboer, however, recommends a more tailored kit. Include a book you enjoy to lift your spirits. Do you require specific medication like insulin or seizure medication that might not be found in most first aid kits? These are important things to think about when preparing yourself for a worst case scenario. Another ingredient she recommends to add to the emergency kit stew is money. She notes that if the damage is extensive it could result in ATMs shutting down or not working. Someone in need of food or clothing or medical supplies could find these backup funds a useful tool during the fallout of a natural disaster. Obviously, there is no way to know where you will be or what you will have access to if and when this earthquake happens. But we do know that there is a great potential for it to happen, and we can use that knowledge to be more effective with our planning. We have some semblance of understanding as to what is at stake, and the recent earthquake was a much-needed wake-up call and reason to have a conversation about preparation. Even if we spend time and money planning, preparing, and keeping ourselves informed, we still have to hope that we will, at least, be in the right place at the wrong time.